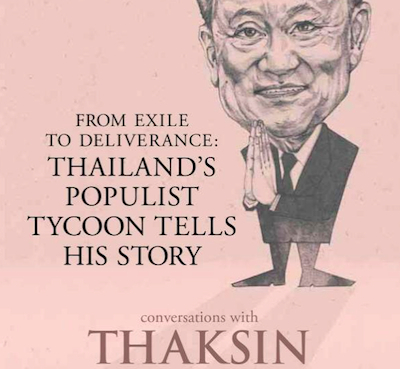 Conversations With Thaksin - From Exile To Deliverance: Thailand's Populist Tycoon Tells His Story is a collection of interviews with Thaksin Shinawatra conducted by Tom Plate. The interviews took place in Dubai, where Thaksin is living in exile, and lasted for over ten hours, thus Thaksin's life - both political and personal - is covered in considerable depth. As its title suggests, the interviews are conversations rather than probing interrogations: Thaksin is essentially given a platform to rehabilitate his reputation, and the author rarely challenges his version of events. (In that sense, the book has unfortunate echoes of Sunisa Lertpakawat's Thaksin, Where Are You?) The title also implies a certain informality, and this is reflected in Plate's colloquial writing style. Phrases such as "wow, everyone seemingly is in an excellent mood!" feel inappropriate for a political interview. Astonishingly, Thaksin suggests that he could return to Thailand by royal appointment: "if the monarchy were kind enough to appoint me as an advisor to the Crown Property, I can help Crown Property do better financially." He adds, "But I don't want to have a Privy Councilor position", as if such an offer were even remotely possible. The various controversies of Thaksin's premiership are reconfigured with Thaksin in the role of victim. He says that the sale of Shin Corp. to Temasek (arguably his biggest miscalculation) was actually his children's idea: "My children, they came to me, they said... it might be a good idea for us to sell." The confiscation of his assets is mentioned only in relation to his decision to sell Manchester City FC: "With assets frozen in Bangkok, I didn't have enough money to support the club." Thaksin even uses the notorious Tak Bai incident to elicit personal sympathy: "the tragic and embarrassing incident was part of the plot to topple me". Plate sides with Thaksin and his wife over the Ratchada land deal conviction: "In fact, there was no duplicity. She didn't hide anything." He glosses over the thousands of deaths following Thaksin's drugs crackdown: "Innocent people were being scooped up in the military sweeps", though devotes multiple pages to softer issues such as Thaksin's sporting interests and shopping trips.